Technology and trends are falling in place for Apple’s upcoming iCloudBook – a revolutionary laptop where the primary data storage is all on the iCloud – i.e. in the iCloudDrive, with the local Hard Drive just being a ‘working copy’. In a previous post, I described new technologies that Apple has introduced in Mac OS X Lion, that portend the Apple Cloud Laptop – or what Om dubbed the iCloud Laptop. In this post, I’d like to describe what the user experience for what I now call the iCloudBook might look like. But first – here’s a memorable excerpt (around 13 minutes in, via GigaOm) from Steve Jobs’ closing keynote at the WWDC ’97. In it, he describes his vision for a ‘cloud hosted’ filesystem for a computer. 14 years later, we’re nearing the realization of his dream. So what does the user experience for the iCloudBook look like? When you unwrap the iCloudBook and boot it up, the first thing you do, is enter your iCloud credentials, or create a new account if you don’t have one. Apple then asks if you want your Hard Drive to live on the iCloud, or not. Compelling reasons are given for the former for now – but over time, the latter option won’t even exist – your primary data will always live on iCloud. Just say ‘Yes’, and Apple will take care of all the details – all your data will now live primarily on the iCloud – and you can continue using your iCloudBook just like you’ve always done. In reality, your local Hard Drive will just be a copy of the iCloudDrive, but you won’t need to know or care about this at all! Note: This isn’t going to be a ‘sync’ – ie, the iCloudDrive won’t try to keep up with the local Hard Drive and vice versa – the iCloudDrive really will be the primary copy of the data, with the local Hard Drive being secondary. This is consistent with the overhauled data model introduced with iCloud – with primary data (eg addresses, calendars) always living on the Cloud – versus the previous MobileMe/.Mac incarnations, where there was no designated primary data source, and every device simply tried to keep in sync with all other devices via MobileMe/.Mac. Each time you edit a file or use an application, the iCloudBook simply and silently uploads these changes to the iCloudDrive. This doesn’t seem right – let’s say you made a tiny change to a 3GB Movie file, wouldn’t iCloudBook have to upload the entire Movie file? That would take forever! Well, Apple introduced new technologies in Lion, that let Apps write files in such a way, that make this iCloud upload much more efficient. In effect, if you make a tiny change to a ginormous file, only a small change gets written to your local Hard Drive, and hence only that small change gets uploaded to iCloud, not the entire file. In fact, Lion Applications support ‘Auto-Save‘ – where each time you make any change to a file, your changes get saved to your Hard Drive automatically, without requiring an explicit ‘Save’ action. Because of this, uploads of changes to your files to the iCloud also happen all the time, instead of only when you hit ‘Save’. Nifty! Since all of your file changes are getting uploaded to the iCloud, right from when you booted up the iCloudBook for the very first time, you have a full backup of all the work you’ve ever done on your laptop. Isn’t that cool? In fact, you can access this full, versioned backup of all your files, via the iCloud Time Machine – a browser-based interface to the iCloudDrive. Just log in using your iCloud credentials at a CyberCafe, and access not only the most recent version of your file, but the one from 2 months ago. In fact, with this in place, who needs a disk-drive based Time Machine anymore? If you thought Apple’s backup system was simple, get ready for the iCloud Time Machine! While technically possible, who in their right minds would let all their sensitive data stored on Apple’s servers? Do you really want some random Apple employee to have access to your entire Hard Drive? Well, Apple has supported a useful but clunky feature called FileVault, for some time now. You can basically lock your Home directory on your Apple computer behind a password, so that even if you lost your computer, no one would be able to access your private data, typically stored in your Home directory, even if they could hack into your Hard Drive. One thorny issue with this has always been – where do you store the so-called ‘Master Password’? That is, if you happened to forget your own password, you’d lose all access to all of your stuff, permanently. That is scary – and this is probably the reason this encryption isn’t on by default, and why many people (including me) don’t use this awesome feature. Enter iCloudBook. As part of your initial setup, Apple asks if you’d like to encrypt your Home directory for extra security. If you do, Apple acts like all good SaaS applications – asks you for challenge questions along with the Master Password (this is new in Lion). These are stored with your iCloudDrive, so in the future, if you forget your Master Password, just answer Apple’s challenge questions to unlock your iCloud hosted Home directory. What a neat way to solve the ‘Master Password’ master storage conundrum – by acting just like any other SaaS service! This also solves, to a certain extent, the concern people might have about store their Home directory on the iCloud. With an Encrypted Home directory, while your data is stored on the iCloud, it’s only stored as bits and bytes – these bits can only be interpreted as files and applications when they’re ‘unlocked’, when you physically log in to your actual iCloudBook hardware. And yes, Lion has introduced new technology specifically to support this scenario. Apple has been phenomenal about building excellent migration tools that allow you to quickly and seamlessly transfer your data from one computer to the other. Thanks to this, I’ve upgraded my Mac laptop every 18 months or so like clockwork, going back to the Mac OS X 10.1 days. The iCloudBook takes this to the logical conclusion. When you get your new laptop, and enter your iCloud credentials, Apple checks if there already is a laptop associated with these credentials. If so, Apple asks if this new laptop is the replacement to the previous one. If you answer in the affirmative, Apple simply downloads the contents of your iCloudDrive to this machine, and in a matter of hours, you’re ready to go! Because the iCloudBook is designed to be constantly connected to the iCloud, the ‘Remote Wipe’ feature of the iPhone is directly applicable. Compared to an iPhone, the ‘Remote Wipe’ option for a laptop is downright scary. All said and done, there isn’t likely to be as much ‘mission-critical’ data on your iPhone that you’d hesitate to wipe it if you find it’s in bad hands – but if you Remote Wipe a laptop, and you don’t have a full, reliable, backup, you’re really hosed. With the iCloudBook, however, since all your Hard Drive data is actually on the iCloud, it’s perfectly safe to Remote Wipe your computer. If you recover the laptop, just let Apple download all the data back on to the computer again! It is unlikely that we’ll be in a world anytime soon, where we’re constantly connected to the Internet, without fail. If the iCloudBook really wants to upload to the Internet all the time, how does it cope? Well, more new technology in Lion allows the iCloudBook to ‘save up’ all the data it needs to upload to the iCloud, such that when the laptop next connects to the Internet, it can catch the iCloud up with the local Hard Drive. Simple. The iCloud doesn’t come free to Apple – in order to implement all this, they’d have to store not only the contents of each of the Hard Drives for all the iCloudBooks in the world, but also each and every edit made by each and every iCloudBook user, to any of their files. In fact, if you imagine a slow typer, Apple would be uploading each and every one of their keystrokes, one by one, as they slowly type up an email on their iCloudBook! But this isn’t a new, or entirely inconceivable, problem. Google is already doing this with Google Docs – as you edit a Google-hosted document, each edit you make gets stored remotely, with an infinite revision history. This does requires a huge data center investment, however – and Apple has already started down this path. Some reporters have commented how Apple’s Maiden, NC Data Center is grossly overbuilt, given what the iCloud has been described as being so far. But if you believe in the iCloudBook vision, I feel this is just the beginning – and I see many more data centers in Apple’s future! John Siracusa remarked that one of the key technologies in Lion have their genesis in research around ‘network filesystems’ – ie, cloud-hosted directories. This is not a coincidence. Too many technologies in Lion, across multiple disparate systems, are simultaneous optimizing for an almost constant Internet connectivity, and reduction in the amount of data written to the Hard Drive at any given time. This cannot be a coincidence either. As Steve Jobs promised in the ‘Back to Mac‘ keynote, the best lessons from the iOS ecosystem will flow back to the Mac. Indeed, the iCloudBook builds on the assumption of near-constant Internet connectivity, prominence of the cloud-hosted services and highly capable hardware running locally. Intriguing, but I think you are missing something fundamental. Start with the obvious, OS X may be part of Apple’s future, but it isn’t all of it. iOS devices are already generating a clear majority of Apple’s overall revenue. Put that fact squarely in your sights and then think through some of those lion technologies again. Now what do you see? Picture working on a presentation for a client meeting tomorrow morning. You wrap it up before going home for the night, but you leave your laptop in the office because you are planning to travel light. Next morning, before your flight, you pull out your iPhone while you wait in line for a latte at Starbucks. You open keynote, and your presentation is there for you to review. Before you board, you make a few text changes. Once you are seated, you pull out your iPad, fire up keynote, and fix some of the diagrams in your slide. As you move from device to device, you never even think about saving and copying the latest version of the file, but it’s available to you whenever you need it, wherever you need it. 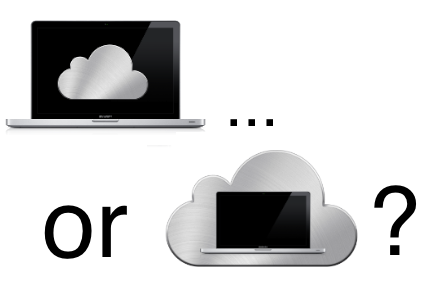 iCloud + iOS 5 + Lion provide the basis for a seamless, pervasive computing environment.